When the topic of credit comes up in one of my classes, people tend to have lots of questions about it. However, I am always shocked on the amount of people who don't check their credit on a regular basis. Below are some great reasons on why you should check your credit report! The Fair Credit Reporting Act requires the three credit bureaus, Experian, Transunion and Equifax, to provide you with a FREE copy of your credit report at least once a year, but you MUST request it from them! You can get your free report at www.annualcreditreport.com or by calling 1-877-322-8228. (Just as a side note, you will be asked verifying information, if you are unable to answer the questions you may need to fill out the paper form.) For more information about checking your credit report free, go here. 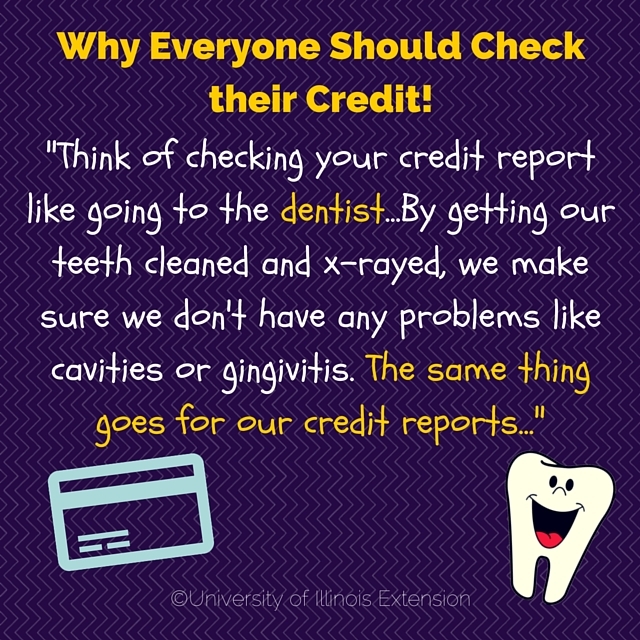 Think of checking your credit report like going to the dentist. We all have to get our teeth checked. By getting our teeth cleaned and x-rayed, we make sure we don't have any problems like cavities or gingivitis. The same goes for our credit reports, we want to make sure the accurate information is correct and fix anything that might be wrong. According to a study done by the Federal Trade Commission, CreditCards.com reported that "One of every five American consumers has an error on his or her credit report and 5 percent of us endure errors so serious that we likely are being overcharged for credit card debts, auto loans, insurance policies and other financial obligations…" By checking for errors, we can correct any problems before they get bigger, especially if they influence the annual percentage rates of our purchases. If you do find an error on your credit report, please check out the CFPB's how to dispute an error on my credit report! If you or another family member has a similar name you'll want to check make sure your name and other identifying information is accurate. For example: If members of your household have the same name like William or John. When this happens, it's best to use a middle initial every time you apply for credit. Try to use the same name every time you apply for a loan. One way to protect yourself from identity theft is to check your credit report on a regular basis. If you haven't checked your credit in a few years, it might be best for you to check all three at the same time, then spread it out to check one bureau every four months. One place to check on your credit report for possibly identity theft is your current or former addresses. You want to make sure all of the addresses are yours. This could indicate that someone has taken on your identity in another state or city. 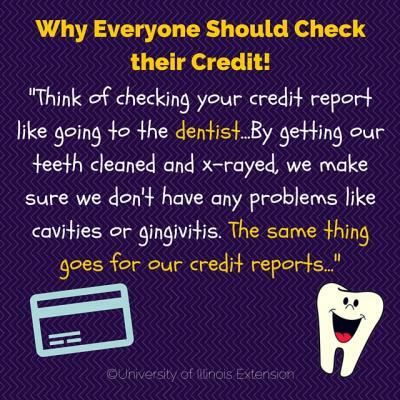 Also, check and make sure all accounts on your credit report are yours. If you feel you have been a victim of identity theft, please go to https://www.identitytheft.gov/ and follow the steps to help rectify the situation. Although there are more reasons to check your credit, like when you're looking to buy a big purchase or about to start a new job – you should know that you are able to check your report for FREE every year from each of the credit reporting bureaus. When you do get to check your report, you need to check for error, because these can be easily fixed. By checking your credit, you are taking a preventive measure to prevent yourself against identity theft.